The first recognized race for midget cars was held in California in the summer of 1933, and by 1937 it was one of America’s fastest growing recreational experiences, spreading across the nation like wildfire. Midget cars, weighing approximately 750 pounds, with wheelbases ranging from 66 to 72 inches and car bodies that rested as low as four inches off the ground, were miniaturized versions of the much larger AAA Championship Cars that were running at tracks like Indianapolis. These lightweight cars ran at speeds upwards of 70 to 80 mph down the straightaways, taking the turns between 40 and 50 mph. Taking the turns in a midget, at these speeds, was a test of skill and courage. The smaller midget cars allowed for much more economical racing as they could be run on smaller-sized dirt or cinder tracks than the big Champ Cars. The normal track for such racing was a quarter mile in distance, which meant that any cinder track circling a normal-sized high school football field could stage a midget race. In time, midget cars would be racing on outdoor tracks as big as a mile and on indoor tracks as small as one-seventh of a mile. The beauty of a midget car race was that it could be staged just about anywhere. Once the midget craze took hold, drivers towed their midget cars across the country, looking for the most lucrative winning purses. In the Chicago area, the first midget race was held at the old Calumet Speed Bowl in Lansing in 1934. One of the first midget car races held within the city of Chicago was run on May 19, 1935, at Soldier Field. Soon summertime races could be viewed at Raceway Park in Blue Island, Riverview Raceway off of Western Avenue, as well as Soldier Field. In the winter, they ran venues such as the 124th Field Artillery Armory on 52nd Street and Cottage Grove and the Chicago Amphitheatre. Drivers running Chicago area midget tracks soon gained national prominence. 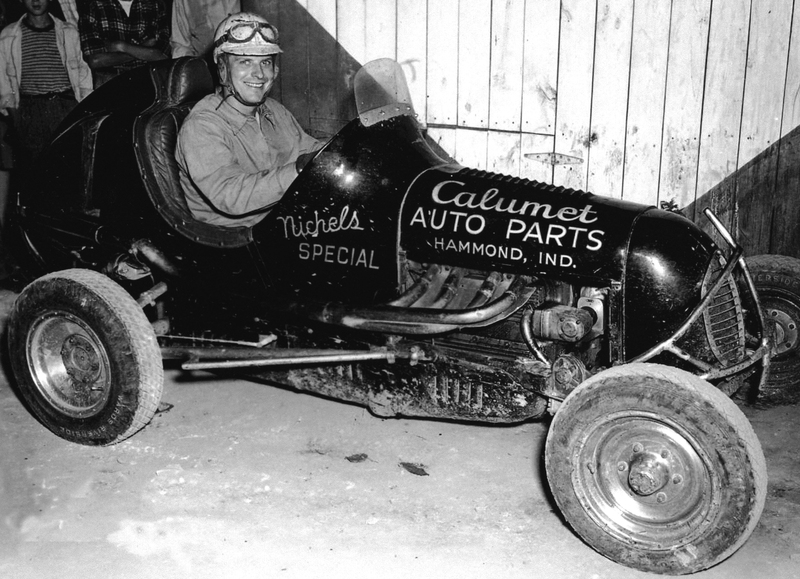 Drivers such as Harry “Leadfoot” McQuinn, Ray “The Highland Park Flyer” Richards, Myron “The Milwaukee Blitzkrieg” Fohr, Teddy “The Flying Rail” Duncan, Pete “The Flying Serb” Romcevich, Frank “Candy Man” Burany, Bob “Bombshell” Muhlke, Joie “Chief Wahoo” Chitwood, and Mike “The Flying Irishman” O’Halloran, all raced on tracks in and around the windy city. But within this group of great racers, even a smaller more revered fraternity existed and it became known as The “Chicago Gang.” The fast-paced club consisted of Wally “The Human Cyclone” Zale, Tony “Tinley Park Express” Bettenhausen, Dennis “Iron Duke” Nalon, Cletus “Cowboy” O’Rourke, Jimmy “South Side Speed King” Snyder, Emil Andres and Paul Russo. Though all of the members of the “Chicago Gang” came to win various track championships, Wally Zale was the driver who set pace. In 1936, Zale won a record 65 features in a single season. He broke his own record in 1940 scoring 67 victories, believed to be the greatest number of wins in a single season by a midget driver. Tragically, Zale’s career ended prematurely when he was killed in his own passenger car when struck by a train in April of 1942. All but O’Rourke went on to race at Indianapolis. Their collective record in Indianapolis 500 competition was quite impressive, 52 starts, three poles, seven top five finishes, 15 top-10 finishes, $233,888 won in competition, 5841 laps completed for a total of 14,602 miles run at the worlds greatest speedway.